Graffiti, street artist, toy maker and clothing designer, KAWS or Brian Donnelly, has become the face of contemporary art since breaking onto the New York art scene in the early 1990's. His use of graffiti styles with cartoon iconography has brought art not only from the streets to worldwide recognised galleries but also into the home. We will outline how he done this by looking at his early street works, his decision to pursue toy making and his substantial list of collaborative efforts over the years. Studying Illustration in Art College, he never seen graf as a career path, just a hobby, but wanted to pursue some ends in the arts industry. This led him to working as an animation artist when leaving college, just for the reason that he wanted to get paid to paint. He even worked as an animator on the Nickelodeon shows 'Doug' and 'Daria' in the 1990's. He never saw this as his end goal though. It was just a paycheck and allowed him to move into New York City. It was around this time he started doing his billboard murals and really messing up the advertising industry that was dominating NY streets at the time. Graffiti crews in New York were going around and finding blank walls to draw up elaborate and collaborative murals, but as KAWS worked solo, he used the billboards as the background for his murals. Essentially making the billboard marketing team his crew. It allowed him to get fully creative with an already made piece and he done this in such a sick way. Like honestly. It even prompting Captain Morgans to use the style in a marketing campaign. From starting out going over billboards and reinventing the image, KAWS began to take it closer to the street and eye level. Taking out the posters in phone booths with a key he somehow managed to get his hands on. He would then take the poster home, recreate the advertising with his own cartoon iconographys. 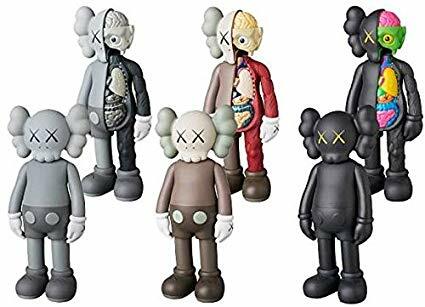 Expecting to experience lawsuits from his work, KAWS' was shocked when the public and the advertising industry vibed with it. There is crazy parallels between marketing and street art. Repeated imagery and branding are fundamentals in both. This is when KAWS starting painting 'The Companion', the skull with the cross outed eyes. It was first seen in a reimagined Marlboro billboard he done on a New Jersey highway. He even got a cover feature in an issue of ID in 1997 for his work on the phone booths. From here, 'The companion' just grew as an image. Its easy to understand why as well. It is a univesal. Skulls have been symbols in every culture throughout history, regardless of language barriers. Once the brand was set, it became a way for KAWS to give up the 9-5 animating job. Releasing his first toy in 1999 in collaboration with Hikaru Iwanaga, the founder of Bounty Hunter Toy Shop in Tokyo. This is where a personal fascination with his work grows. It is one thing to reimagine a billboard but his ability to open up to new mediums is crazy. Toy making is very similiar to sculpture in a lot of ways. Releasing the companion as a limited edition toy run allowed a sculpture to skip the gallery setting and go straight into the home. The similiarities to Mickey Mouse are just the follow on from his work of reinventing images to allow them to make sense to his audience. Adults vibe with his billboards and kids like Mickey Mouse. It made complete sense. His experience in animation also contributed to this but it took things off the screen and into the 3d realm. It did take a while for this to take off however, he relied on retailers to sell his product on consignment. Which led to huge payment problems, resulting in him ditching the middle man and setting up his own website to bring the product straight to an audience. Which kind of disrupted the system he worked in and made him only reliant on himself. From here, he began collaborating. Starting off deconstructing popular character images and reinventing them under the guise of 'the Companion.' Once you disregard the narrative of the established character you are working with then it becomes easy to manipulate things - shapes change and so does the fludiity of the character. It gets a new identity and KAWS was the first person to do this. From moving from the streets to the home initally, it was in 2008 that he finally stepped inside the gallery. Running an exhibition in Miami with Emmauel Perrotin, that was curated by Pharrell Williams and featured works by KAWS done for the show and pieces owned by Pharrell himself. Today, it is difficult not to find an exhibiton by KAWS somewhere in the world, and his thoroughness in completing the exhibition is insane. He examines the locations before agreeing and completes his sculptures of 'Companion' based on the architecture of that certain location. This allows him to be in complete control of his work but also incredibly flexible at the same time. From exhibiting his work his profile grew, leading to a float of 'Campanion' in the Macys Day Parade, redesigning the Moonman award for MTV to designing the artwork and branding of Kanye West's 808's & Heartbreaks album. His list of collaborations just grows from this, from Nike to Vans to DC Shoes to Uniqlo to most recently designing the setting for Dior's runway show. His audience is as multi faceted as his work. His toys can retail for 200$ in MOMA and his t-shirts can sell around the corner for $5 in Uniqlo. This is what makes him and his art so digestible. it is everywhere, he blurs the lines of contemporary and fine art and in return gives his audience every possible avenue to find him. He is on the streets, he is on your television, on your feet, on your back, in your childs hands and then in your national galleries. He only ever competes with himself and the mediums he wishes to explore. Aside from collaborations and commissions, he is also 100% independent, his toys, exhibitions etc are all self funded. It gives him complete control over his work and this is one of the rarest things you can get in todays world.